This shower curtain ‘s rod allows to realize in the middle of room a very spacious, functional and aesthetic oval textile shower booth. GalboBain took up the challenge: realize a strong and design model fixing on the ceiling. 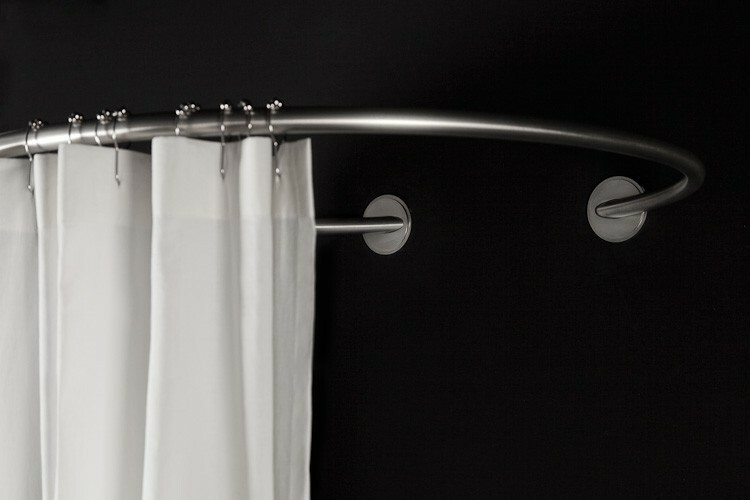 The specific shape of this model allows both necessary shower curtains to cross themselves at the level of their junction and so assure a perfect protection against spatters. The length of the booth depends on the position of both rods composing the model and can vary between 130 cm and 170 cm. This fixing on the ceiling GalboBain’s model allows to equip all the “bathtubs islands”, and to realize different lengths oval textile shower booths in the middle of room.